Before a preview of this Saturdays game let's get an update from Training Camp. Since the Broncos win against the Bears last Thursday the Broncos have had two days of camp and two days off. Here is the report from those two practices. Safety Jim Leonhard (knee), safety Quinton Carter (hamstring and knee), wide receiver Tyler Grisham (knee), Danny Trevathan (ankle), fullback Chris Gronkowski (groin), defensive tackle Justin Bannan (calf) and tackle Ryan Harris (ankle) did not participate in Saturday’s practice. Cornerback Tracy Porter was held out of part of practice due to a hamstring injury. In addition, Head Coach John Fox said linebacker D.J. Williams was excused from practice due to a personal reason. Linebacker Keith Brooking was able to participate in practice wearing full pads for the first time since signing with the team. He took the majority of his reps with the second-unit defense. Running back Ronnie Hillman, who didn’t play in Thursday’s preseason opener due to a hamstring injury, found plenty of space down the sideline during team drills. 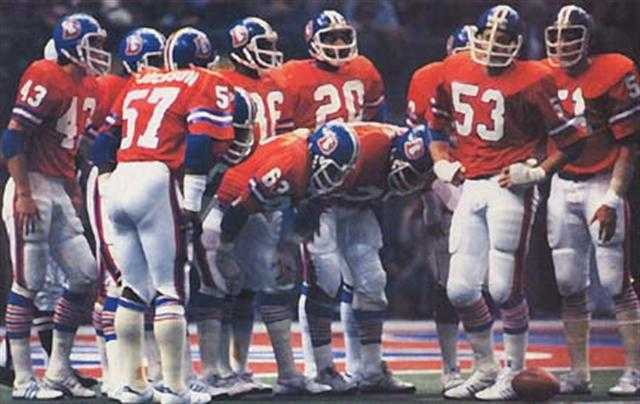 Quarterback Brock Osweiler rolled to his right and dumped off a pass to his fellow rookie, and Hillman raced up the field for a big gain. Wide receiver Gerell Robinson made a couple of notable plays during practice, first leaping for a deep connection from quarterback Adam Weber. Later during red-zone work with quarterback Caleb Hanie, he caught a diving touchdown at the front of the end zone. During 9-on-7 drills, defensive tackle Ty Warren stuffed a run at the line of scrimmage, drawing praise from the defensive sideline. Later in the drill, running back Xavier Omon busted a run up the middle, breaking several tackles and garnering cheers from the crowd in the process. Caldwell was active during team drills, hauling in a sideline catch and then running the ball on an end-around on the very next play. The defense had a big day at practice, generating a good amount of pressure throughout the session. 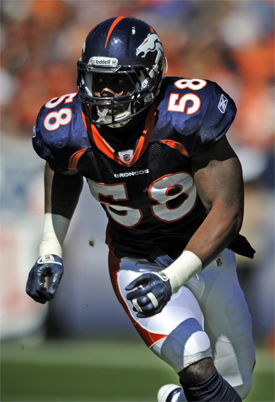 Both Mitch Unrein and Jason Hunter nearly had "sacks," (keep in mind, quarterbacks are off limits), and linebacker Von Miller chased Manning out of the backfield on another play, forcing the four-time NFL MVP to throw the ball away. Early in practice, the defensive line ran through a drill where one lineman acted as a running back and the other’s job was to make the tackle. Throughout, the linemen seemed to enjoy playing on offense just as much as making the big hit. Defensive tackle Sealver Siliga juked out defensive end Jason Hunter pretty badly, which inspired the rest of the group. Defensive tackle Kevin Vickerson was next up with the football, throwing in a few stutter steps and yelling out "Mike Vick!" Broncos alumni continue to head out to Dove Valley during training camp. Watching Saturday’s practice was former Broncos player-coach Jimmy Spencer. 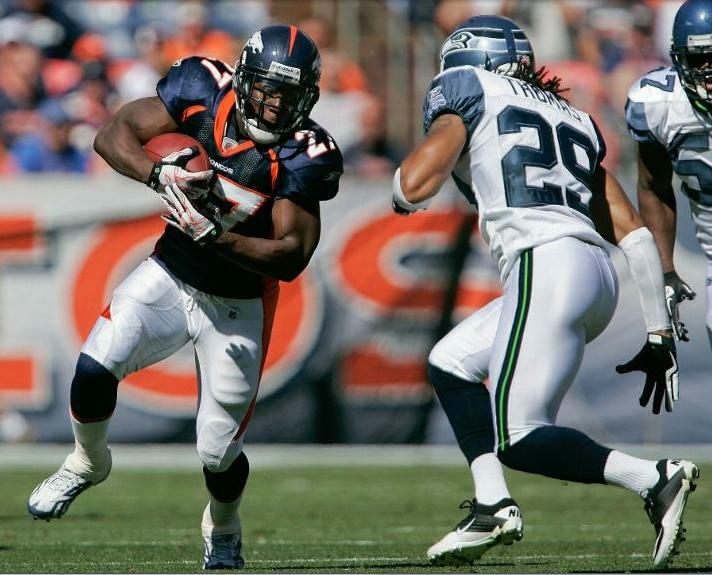 A cornerback in Denver from 2000-03, Spencer pulled double-duty in his final season in Denver, also handling assistant defensive backs coach duties. 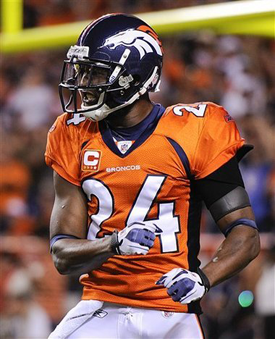 Nicknamed "Teach," Spencer was Denver’s defensive backs coach one his playing days were over in 2004, and also served as assistant defensive backs coach again in 2005 and 2006. The Broncos had this day off. After the team had a day off Sunday, the Broncos returned to the practice fields at Dove Valley at 10:35 a.m. Monday morning. The practice was originally scheduled to start at 2:20 p.m., but was moved up to avoid bad weather forecast for later this afternoon. The decision allowed the Broncos to practice in some of the most favorable conditions of camp, as it was 77 degrees with a light breeze blowing throughout practice. Here are some notes from the practice, which featured a number of big plays in the passing game. Safety Jim Leonhard (knee), safety Quinton Carter (hamstring and knee), wide receiver Tyler Grisham (knee) and linebacker Danny Trevathan (ankle) did not participate in Monday’s practice. Linebacker Keith Brooking left practice with a hamstring strain. Defensive tackle Ty Warren was excused from practice for personal reasons. Linebacker D.J. Williams was back in pads after not attending Saturday’s practice, and defensive tackle Justin Bannan dressed out, marking the first time in a few practices that Bannan has participated. In one-on-one drills, what looked like a completion to Decker was slapped out of his hands by Bailey near the sideline. Later in the drill, Decker broke free for a touchdown. During 7-on-7′s, Decker was able to get behind Bailey and haul in a deep post route for a long completion. Arguably the most notable play between the two happened when Decker got a step on Bailey on a go route during a team drill. 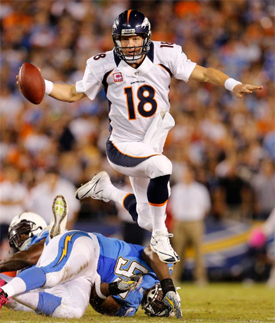 Quarterback Peyton Manning’s pass dropped right into Decker’s hands. Decker’s momentum carried him up the hill near the sideline, and as Decker made his way back down, Bailey gave him a thumbs-up. Wide receiver Demaryius Thomas enjoyed a big afternoon, making several highlight-reel catches. Thomas pulled in one touchdown reception during a red zone period on a fade route with cornerback Tracy Porter and safety Rahim Moore in coverage. A few plays later, Thomas hauled in another touchdown after faking to the outside and breaking back toward the middle of the end zone, where he was all by himself for the catch. Another wide receiver who played well was rookie Gerell Robinson. Robinson made a nice catch near the sideline for a touchdown during the red zone drill. Later, during a team drill, Robinson leaped to make an impressive catch along the sideline for a substantial gain. Quarterback Brock Osweiler used a pump fake to help freeze the defense, then fired a perfectly thrown pass to a streaking Julius Thomas, who made the reception in stride. After the play, Defensive Coordinator Jack Del Rio shouted to his defense, "Don’t fall for the pump!" One of the best runs of the afternoon came from rookie running back Ronnie Hillman. Just one play after a scrum broke out during 9-on-7′s, Hillman took a carry designed to stretch toward the right sideline, stopped on a dime, and raced back toward the left side of the field, making it all the way to the end zone untouched. Game Two of the preseason is against the Seahawks. It is expected that the lower roster players, the 2nd team and below will have more game time than last week. Therefore we are looking at some of those players on the bubble to step up and those that performed well last week to carry that performance over. The number two quarterback is still up for grabs. This week we will probably see more of Hanie and Weber with a little Osweiler thrown in. If Weber and Osweiler outperform Hanie, he could be facing the chop. For the running backs expect to see more Knowshon. Omon and JJ are hot on his heels and that last running back spot is looking like a tough fight. A great game by one of these guys could separate that player from the pack. With Julius Thomas heating up at practice can he make an impact during the game? He will need to impress as does Green with Ingram having a good first game. Receivers are looking pretty set but can either Jason Hill or Gerell Robinson push for the last spot. We will see a heap of the back up O-Line during this game. I personally am hoping to see something out of Ryan Harris or Philip Blake. Round two of Hunter vs Ayers gets underway, who will come out on top? Wolfe should get some more work and I am looking forward to that. But look for big games from Siliga, Garland, Big Vick and Jackson. Nate Irving, Mike Mohamed and Danny Trevathan. These three guys need to have solid games to keep Keith Brooking at bay. For the corners I want to see more out of Squid and Bolden. Squid also needs to take more opportunity with his returns. That is it from me, enjoy the game and Go Broncos! ~ Aussie. Looks like Kuper broke his arm and will miss 4-6 weeks. They may now be forced to move Franklin inside and bring on Harris. Julius Thomas may also be hurt and Hillman tweaked his hamstring. Keith Brooking strained his hamstring also. Jason Hunter also missed a portion of the practice with a triceps injury. Broncos RG Chris Kuper is expected to be sidelined six weeks after suffering a broken ulna in his forearm during Tuesday's practice. Tough luck. Kuper was working hard to return to form after suffering a dislocated left ankle as well as a broken tibia and fibula in last year's season finale. Manny Ramirez is next up on the depth chart, though an alternative would be moving RT Orlando Franklin inside and starting Chris Clark or Ryan Harris against the Steelers, Falcons and Texans the first three weeks of the season. Broncos rookie RB Ronnie Hillman aggravated his hamstring injury in Tuesday's practice. Hillman had just returned to practice over the weekend after missing nearly a week and a half with the injury. On a positive note, coach John Fox suggested Tuesday's strain wasn't as serious as the early-camp injury. Tough luck for Kuper, I think over the next three weeks they will experiment with the line on that side to get the best combination. Brooking and Hunter are banged up too. And it is disappointing Hillman keeps pulling his hamstrings. I want to see this guy in a game! Now we may get to see Franklin at G after all. I am hoping more for Harris to start at RT and see him dominate. But I ain't holding out hope. Looks lke we have lost Hunter for a few months. Ayers needs to step up and take that position now. I believe he only got his license suspended for 9 months. More will probably follow. Looks like Hunter is done for the year. He had surgery and will miss 4 months. 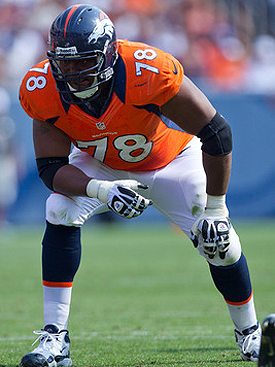 This link also has a picture of Woodyard because remember last year they changed numbers. Also forgot, big story about this weeks game T.O is playing haha. Came away from yesterdays game with a few injuries. Mike Mohammed and Joshua Moore both suffered injured hamstrings against Seattle, as well.